Undergoing cataract surgery can result in significant improvement in your day-to-day life. At Southwest Eyecare & Laser we have helped many patients improve their vision and overcome the challenges that this eye condition had previously presented. Dr. Gregory A. Stainer has been providing patients with quality cataract surgery services for nearly 40 years in Bakersfield, CA. The benefits of cataract surgery not only include clearer vision, but also increased confidence and independence. Intraocular lenses (IOLs) are synthetic devices designed to replace a clouded crystalline lens. Traditional IOLs provide focus at just one distance, and patients usually continue to use glasses for tasks such as reading or driving. However, we also offer premium options that can greatly improve focus at a range of distances. Multifocal IOLs can provide sharp vision tailored to the visual demands of your daily lifestyle. Multifocal IOLs can be tailored to address nearsightedness, farsightedness, or astigmatism. We also offer Toric IOLs, which are ideal for patients suffering from both cataracts and astigmatism. We take careful measurements to determine the most beneficial power and orientation of your Toric IOL implant. Providing these versatile options allows us to offer our patients the best-suited IOL for their needs. Multifocal IOLs often allow cataract surgery patients to minimize their dependence on corrective eyewear. Advanced laser technology has improved upon traditional cataract surgery for a more efficient and effective procedure. Using this technique instead of the traditional blade, Dr. Stainer is able to perform your surgery with increased precision and minimal damage to the surrounding tissues. Laser-assisted cataract surgery requires fewer movements within the eye, which can lead to fewer complications, less inflammation, and decreased swelling. All of these factors contribute to a safer procedure with reduced healing time so you can return to your daily activities as soon as possible. Making strides in your ocular health and ability to face your day with fewer barriers can also have a positive effect on your emotional and mental well-being. By correcting your blurry vision, you can regain your independence as it will be safer for you to engage in regular activities with fewer worries. Cataract surgery can allow you to safely drive, read, play sports, and engage in other activities that require clear, dependable vision. The subsequent improvement in self-confidence and overall life enjoyment cannot be overstated. At Southwest Eyecare & Laser we have helped many patients improve their vision and overcome the challenges that this eye condition had previously presented. 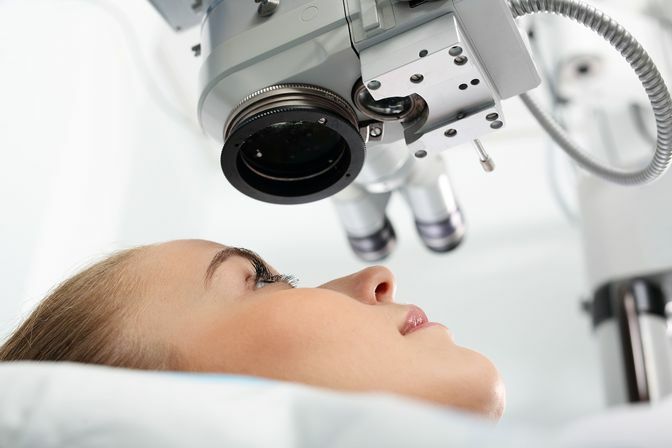 The benefits of laser cataract surgery far outweigh the risks. Our team can help you alleviate your blurry vision and the burden it has placed on your life. Contact us online or call us at (661) 833-4040 to schedule a consultation.